Without FCA, the U.S. market would be down 1.2% this month. Ram (+14%) and its pickup shine. Whereas most analysts had predicted a drop, the U.S. new light vehicle market edges up 0.2% year-on-year in October to 1.359.980 units, leading to a year-to-date tally up a similarly reserved 0.5% at 14.309.010. The Seasonally Adjusted Annualised Sales Rate is down 2.1% year-on-year to 17.59 million, yet this is the highest so far in 2018 and since November 2017 (17.65m). The unexpected market uptick, as tiny as it is, can be solely traced to Fiat Chrysler Automobiles, shooting up 15.4% year-on-year to almost 180.000 units, buoyed by extremely strong deliveries at Jeep (+8.5%) up for the 10th straight month, Ram (+14%), Dodge (+38.4%), Chrysler (+20.6%) and Alfa Romeo (+44.1%). Among the Top 6 Groups, only Toyota Motor (+1.4%) posts a (slim) gain only thanks to the Toyota brand (+1.7%) whereas Lexus (-0.8%) drops. In contrast, General Motors (-5.3%), Ford Motor (-4%), American Honda (-4.1%) and Nissan Motor (-9.5%) all post significant losses. This posts includes exclusive BSCB estimates for all October General Motors brands and models sales as the company now only reports quarterly. 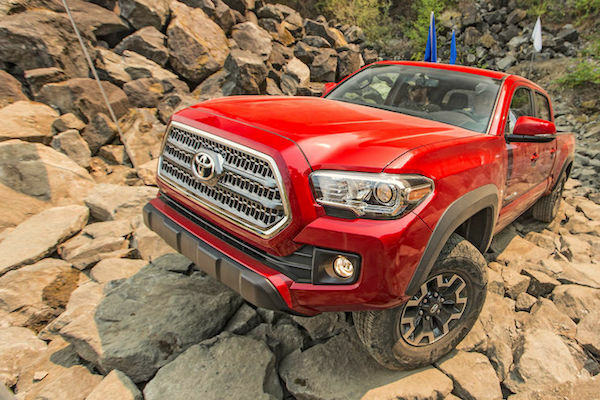 The Tacoma posts a 10th consecutive double-digit gain, helping Toyota Motor up 1.4%. Further down, Jaguar Land Rover (+25.4%) excels, Daimler AG (+0.9%) and Hyundai-Kia (+0.7%) edge up but the BMW Group (-1.3%) and the Volkswagen Group (-3.9%) are in decline. Subaru (+2.5%) extend is streak of year-on-year gains to 83 consecutive months but Audi’s equivalent streak of 107 months is brutally ended by its first drop in 9 years (no interruption since October 2009) at -17.3% this month. Tesla (+861%) is up almost 10-fold on October 2017 thanks to the gearing up of the Model 3 but drops two spots on September to #17, back below BMW and Lexus. Volkswagen (+4.6%) and Hyundai (+2.8%) are also strong while further down Land Rover (+43.3%), McLaren (+23.5%) and Infiniti (+15.4%) also impress. After 16 consecutive months of year-on-year gains, the Ford F-Series (-7%) endures a second straight decline and impacts the performance of the Ford brand as a whole, counting for 38% of its deliveries this month. 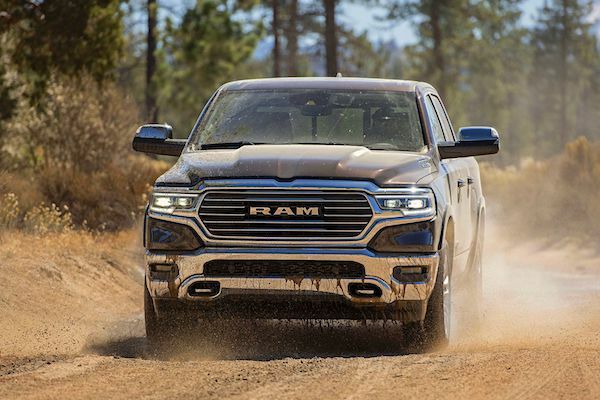 The Ram Pickup (+11%) holds onto the #2 spot for the third consecutive month, scoring its third highest ever volume at 49.186 below the 51.856 of last month and the 49.912 of last August. Let this sink in for a minute: whereas Ram’s previous record (48.710 in July 2005) stood for over 13 years, it has been beaten three consecutive times this year. The Chevrolet Silverado (-14%) ensures the podium is 100% full-size pickup, followed as is the case year-to-date by three SUVs: the Toyota RAV4 (-0.2%), Honda CR-V (+0.2%) and Nissan Rogue (-8%). Below, the Toyota Camry (+3%) uncharacteristically posts a gain just as all other top-selling passenger cars struggle mightily: the Honda Accord (-11%), Civic (-26%), and Toyota Corolla (-11%) all fall by the double-digits, with the Chevrolet Equinox (+6%) finding its way inside the Top 10 again. 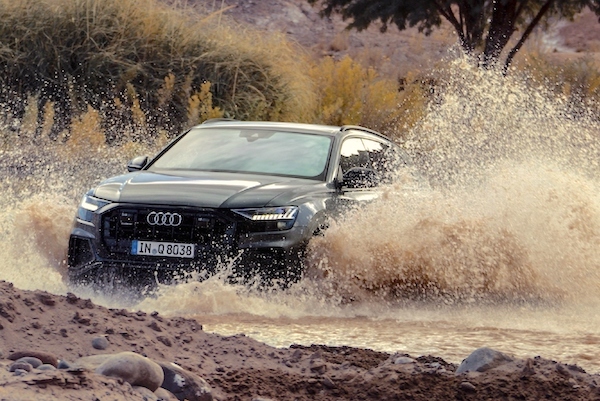 …whereas Audi ends its own positive streak at 107 months, despite the arrival of the Q8. Outside the Top 10, the Toyota Tacoma (+30%) lodges a 10th consecutive double-digit gain, the Tesla Model 3 (+12141%) scores a second consecutive Top 20 finish, with SUVs signing 12 of the 17 largest year-on-year gains in the remainder of the Top 60: the Dodge Grand Caravan (+357%), GMC Terrain (+87%), VW Tiguan (+48%), Audi Q5 (+35%), Hyundai Tucson (+32%), Honda Pilot (+31%), Jeep Compass (+26%), Hyundai Elantra (+24%), Chevrolet Colorado (+21%), Chrysler Pacifica (+22%), Subaru Forester (+19%), Toyota Highlander (+18%), Chevrolet Trax (+17%), Honda Odyssey (+15%), Jeep Cherokee (+15%), Ford Explorer (+13%), Toyota 4Runner (+13%). 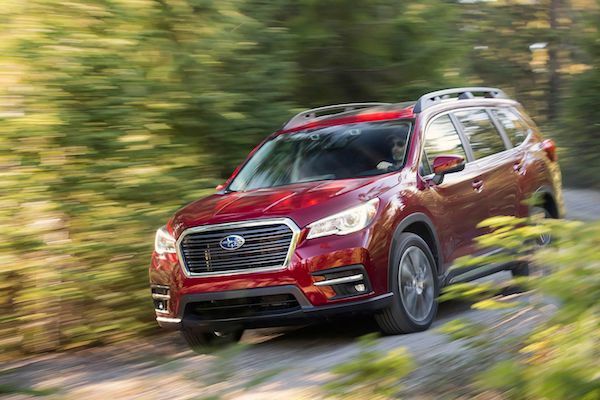 The Subaru Ascent (#65) crosses the 6.000 unit-mark for the first time and remains by far the most popular recent launch (<12 months) above the Ford Ecosport (#85), Hyundai Kona (#89) and Nissan Kicks (#107). Finally, this month we welcome the Audi Q8 (#233) and Jaguar i-Pace (#273) in the U.S. sales charts. Full October 2018 Top 15 groups, Top 40 brands and Top 280 models below. USA 8 months 2014: Discover the Top 273 best-selling models!